Though we adults may readily admit that yoga is beneficial to us some of us may wonder what, if anything, our children can learn from practicing yoga. Educators and fitness experts are now recognising that yoga may be one of the best tools children can have to develop focus, manage stress, and keep their bodies fit. Helen Garabedian, founder of Itsy Bitsy Yoga, has taught yoga to children under four years of age since 1999. She reports that even babies and toddlers can benefit from modified yoga practice. Young children can sleep longer and more deeply. They have better digestion and fewer problems with gas. Their neuromuscular development is improved, and their immune systems are strengthened. In addition, their emotions are more even. Pre-school children have all of those benefits as well as improved body awareness and increased self confidence. They also become socialised into the peaceful surrounding of a yoga studio or a special place at home where they practice yoga. They learn to listen and follow directions. Further, children who are taught yoga at an early age learn a healthy lifestyle that can keep them fit, forestall obesity, and help them relax in a stress-filled world. Yoga postures focus on the spine. As children and adults bend and straighten their spines, blood flow is increased and messages are more easily transmitted to the brain along the spinal nerves. This improves brain functioning and mental clarity. This can help with focus in school and when doing homework. As young bodies change and internal organs develop more fully, yoga can help ease the body into accommodating these changes. It can also minimise discomfort as the bones grow and help moderate mood swings as hormones begin to kick in during adolescence. More importantly, yoga is a physical activity that is not competitive. It is very individual and allows the child to gauge improvement by his or her own standards. After all, it is how we feel doing yoga, not whether we master a particular pose and can hold it longer than someone else. Practicing yoga with our children can help foster stronger bonds with them. We also learn good tools to help us calm our children when they become frightened, anxious, or over-stressed. Sonia Sumar, the yoga therapist and author reports the benefits of yoga practice for children with Downs Syndrome, Cerebral Palsy, Microcephaly, Autism, and even children who have learning disabilities and Attention Deficit Disorder. Yoga can help calm these children and improve their balance, increase their muscle tone, and develop body sense and awareness of their bodies in space. 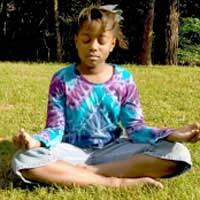 Yoga benefits children as much as it does adults. It can improve flexibility, increase concentration, develop emotional control and inner calmness, improve coordination and balance, and foster better sleep. Taught early, it also provides a lifetime of benefits.